The North Eastern Railway's Rail Motor Bus No. 110 (later No. 130Y) was the result of an experimental conversion. The NER had operated a number of bus services in the Durham since 1912, and one of the buses was chosen to be converted to rail use in 1922. The conversion was officially authorised on 21st September 1922, but the actual conversion was completed in June 1922 and the bus had entered service on 19th July 1922! 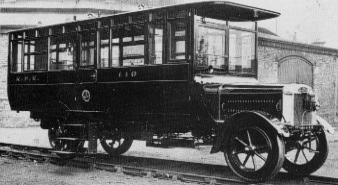 The donor vehicle is thought to have been one of three Leyland Motor Co. buses that the NER purchased on 21st July 1921. With a long bonnet and a overhanging roof at the front, it was a typical design for that time. The conversion was completed at York Carriage Works. Initially No. 110 in the Road Vehicle fleet, it was renumbered as No. 130Y shortly after conversion because No. 110 was already occupied in the Coaching Stock list. Both an additional radiator and an additional driving position were located at the rear of the vehicle. Central passenger doors were fitted to both sides of the saloon. Total seating capacity was 26 third class passengers. Folding steps were also added to allow access from rail level. These were later replaced with fixed steps, and eventually removed altogether. An electric headlamp was also fitted. Initially, the bus had no facility for being towed or propelled, but large U-shaped towing brackets were fitted in 1925. The initial York duty involved a service to Haxby, Strensall, Earswick, and Copmanthorpe. NER Petrol Autocar No. 2105 took over this duty on 9th July 1923, and No. 130 was transferred to Selby. At Selby, No. 130 operated daily return trips to Straddlethorpe, York, Goole, Catleford, Goole, Market Weighton, Cawood, and Hemingborough. This resulted in a full timetable that started at 6:52am and finished at 7:44pm. No. 130 took part in the Stockton & Darlington Centenary celebrations, but continued these Selby duties until November 1926. Disaster struck on 11th November 1926, and the railbus caught fire whilst being filled up with petrol at Selby shed. The entire bus was reportedly gutted within 15 minutes. Reports also suggest that someone used a naked paraffin lamp to check the level of the petrol tank. Only the chassis remained, and it was eventually decided not to rebuild or replace the bus. No. 130 was officially withdrawn from stock on 9th April 1927. The NER petrol rail motor bus was withdrawn in April 1927, and has not survived into preservation. I am not aware of any models of the NER petrol rail motor bus in any scale.